Home vegetable gardens provide you with the healthiest food to eat. Find here vegetable gardening tips that will help you grow healthy food in numerous productive and creative ways. 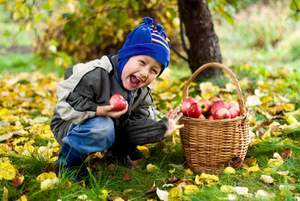 Grow organic vegetables and fruits that will provide you with raw food nutrition. In this day and age of climate change awareness it’s becoming more and more popular to grow your own organic food. Your home vegetable garden is a place where you can make a significant positive impact on the environment. As well as providing you with a cheaper source of more nutritious food, growing your own organic food reduces food miles and pollution. •	Feel the joy of creating your own garden and helping it grow. In addition to providing a healthy food source, the process of organic gardening returns numerous mental and physical health benefits. Easy to grow vegetables are great plants to begin with when you’re starting a vegetable garden. Even if you’re sure you have no green thumb, these vegetables are hardy, fast-growing and nutritious. You can do it! Easy to care for and able to grow in either vegetable beds or containers, these vegetables can be grown in your vegetable patch or on a balcony. The handy thing about growing vegetables in containers is that you can make food grow anywhere. You can create a vegetable garden even when you have no soil. Setting up a container vegetable garden enables you to make the most of your growing space and move your plants around into the ideal position. Looking for a shortcut that will make gardening possible for you? Take a look at the variety of garden kits available. Garden kits make it easy for you to get started growing your own healthy food. When you know how to sprout beans you know how to create a significant nutrient source cheaply, quickly and easily. Increase your vitamin and mineral intake, boost up your protein and charge your immune system. Here’s how to grow bean sprouts and join the ranks of the home vegetable gardeners with a contribution of only 5 minutes a day. 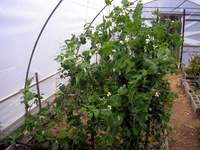 Growing a vegetable garden in a polytunnel extends your vegetable growing season. A polytunnel can expand the scope of your food growing, but requires extra effort to set up and maintain. Learn more.. Here are plenty of small garden ideas for those of you with limited space. 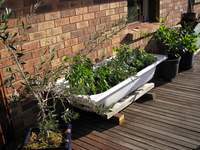 Work out how to best utilise the available space both indoors and outdoors and create several successful small vegetable gardens. Can you find 10 minutes a day for one of these simple vegetable garden projects? There’s an easy way to start building raised garden beds and make them productive as you build. Growing potatoes in old tyres as you raise your edges around them gets your raised garden bed growing as soon as possible. Organic heirloom seeds offer many advantages to the home vegetable gardener. Heirloom vegetable seeds deliver on taste and nutrition whilst providing greater variety and food security. When you grow an organic garden, prioritise growing the foods that are more highly contaminated by pesticides and herbicides. Learn which fruits and vegetables typically have the highest and lowest chemical residues. A layer of mushroom compost on top of a garden bed improves soil structure and provides food and shelter for earthworms and micro-organisms. Making leaf mulch and leafmould compost is easy. Don’t miss your chance to utilise the fallen leaves of Autumn and transform them into a valuable vegetable gardening resource. Getting rid of aphids is a recurring gardening mission. My homemade aphid control works, but it still takes a fair bit of effort to monitor and blast these needle-mouthed suckers. Growing strawberries organically is well worth the effort. Here are a few easy practices and preparations that will help you grow a healthy, productive crop of strawberries in your backyard garden. Enjoy planning a vegetable garden with this 20 point checklist. Taking time for vegetable garden planning before you get in and dig will save you time and heartache down the track. When you began gardening, you may have visualised a beautiful vegetable garden fit for a magazine spread. What can you do when, a few months later, your garden is in a mess? There are tons of safe and natural organic gardening pest control alternatives to keeping unwanted pests out of your garden. Organic pesticides give you peace of mind, an answer to your problems, and organic pure food as a reward for keeping nasty toxins out of the soil. A cabbage white butterfly invasion will leave your salad greens in tatters. If, like me, you’ve had your greens decimated by the white cabbage butterfly caterpillar, you’ll be interested in solutions.